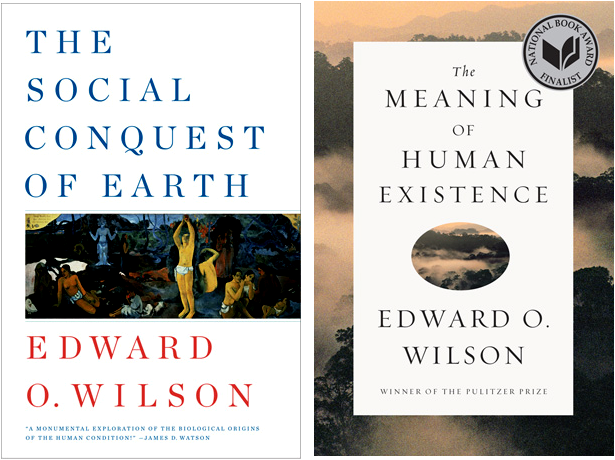 In his latest book (2014), “The Meaning of Human Existence,” Harvard Professor Edward O. Wilson, 85, makes an unwise remark: he calls Oxford Professor Richard Dawkins, 73, an “eloquent science journalist.” If Wilson’s intention had been to plea for higher standards in contemporary media reporting, then Dawkins’ exquisite communication skills, proficiency in science, sharp intellect, and always controversial presence (in the right journalistic sense), would have made him a robust role model for investigative journalism. But Wilson aimed at demeaning Dawkins by invoking the character of a profession, one that has given coverage to Wilson’s career during half a century. The Guardian (U.K.) titled the Wilson vs. Dawkins exchange a “biological warfare.” Perhaps by now the reader realizes how journalistically treasured are these scuffles. But The Guardian’s story itself fed on a previous BBC2’s Newsnight interview, where Wilson reiterated his judgment about Dawkins. Via Twitter, Dawkins responded by reaching out to his one million followers: “anybody who thinks I’m a journalist, who reports what other scientists think –as Wilson described Dawkins’ work— is invited to read ‘The Extended Phenotype’.” The latter, published in 1982, is a follow up to the famous “The Selfish Gene” of 1976; both outstanding scientific contributions to theoretical biology. Before going any further, it is indeed imprudent to use the term “science journalist” as a dishonor, to discredit a colleague, and to inattentively belittle a vital occupation. The Wilson-Dawkins crossfire was triggered by Dawkins’ review of Wilson’s earlier book “The Social Conquest of Earth” of 2012. In it, Wilson drifted away from a well established concept in biology, called Kin Selection, which helps understand why organisms that cooperate with close relatives, more than with strangers, can improve survival and reproduction, thus leaving descendants who carry the traits that make them social and altruistic. The evolution of high sociality, cooperation, altruism and intelligence in the human animal are often explained under kin selection theory (natural selection ultimately favoring kin). Kin selection is an experimentally documented phenomenon, supported by most evolutionary biologists, to the point that when Wilson and collaborators wrote an article for Nature, in 2010 (which became part of a contentious chapter in “The Social Conquest of Earth”), challenging the kin selection principle and suggesting that high cooperation and altruism can still evolve regardless of kinship, 137 world scientists authored and signed a debunk-letter-to-the-Wilson’s position, which Nature published the following year. [Note that in a paper published in PLoS Biology, March 23, 2015, authors Liao, Rong and Queller completely dismiss the Wilson’s team proposal of 2010; in fact, Liao et al. state that “all… apparently novel conclusions –in the Nature’s 2010 article– are essentially false”]. In the 2010 paper, Wilson and associates acknowledged that kin selection could still work, but that an alternative scenario based on a combination of individual and group selection, not necessarily closely related members, results in a mathematically sounder model than the “elderly” –ossified– kin selection. The same assertion appeared in Wilson’s “The Social Conquest of Earth,” about which Dawkins –after borrowing words attributed to American poet and satirist Dorothy Parker— declared: “this is not a book to be tossed lightly aside. It should be thrown with great force.” And sincere regret (Dawkins’ emphasis). Creationists, of course, grew excited about the scientists’ disagreement. Not so fast. Evolution is true regardless of the dispute over kin selection [note that researchers are constantly reexamining hypotheses and paradigms, for example, see discussion about Standard Evolutionary Theory SET versus Extended Evolutionary Synthesis EES in Nature]. And both Wilson and Dawkins, as evolutionary biologists, are secular, openly and vigorously opposed to creationism, including Theistic Evolution, Creation Science, Intelligent Design, and Evolutionary Creation; all represent belief-based views of reality, which impose a Creator or Designer in the background of causality. Wilson and Dawkins have categorically stated that there is no scientific evidence in support of any style of creationism. Unfortunately, the message Wilson sought to convey in “The Meaning of Human Existence” was eclipsed by the exchange with Dawkins; Ed threw unnecessary punches, while Richard diverted them back with customary power; a fight with no winner. And Wilson’s book is crucially important to raise awareness about the current dehumanization of academia at American universities, which seem committed to turning off the humanities (philosophy, history, archeology, anthropology, arts, law, literature and linguistics), dismantling the social sciences, and replacing them with for-profit, translational research to generate goods for patents and commercialization; a path leading to the extinction of curiosity-driven science and risk-taking ideas, which have modernized fundamental scientific work: wisdom driven. In closing, Wilson makes an excellent connection between human evolution and the humanities. He reasons that our history and future survival as prosperous civilizations will depend on the integration of what we discover about ourselves via science, about our bodies, brains and cultures, and on what we internalize from such discoveries via the humanities, the sentinels of knowledge in society (including journalism, my emphasis). And he envisions the relevant humanities under no faith: “the best way to live in this real world is to free ourselves of demons and tribal gods.” — © 2014 by Guillermo Paz-y-Miño-C. all rights reserved.